Interstone Marble & Granite Ltd. imports & distributes marble, granite, porcelain, quartz and engineered stone. 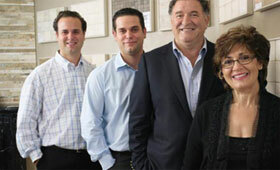 In 1996, Vince and his wife Angela Virgilio founded Interstone. With over 30 years of experience and the help of their two sons, Mark and Robert, they have successfully grown their business to be the largest in Ontario. With superior service and the largest truck fleet in the industry, you can expect prompt and secure delivery anywhere in Ontario. Our mission is to provide our customers with complete satisfaction every time they deal with Interstone. We strive to keep our prices fair and to provide great products and services to our customers. We are committed to offering quality service and a large selection of the latest materials in the industry. At Interstone we always keep beauty, style, elegance and timelessness in mind so that our customers know when they walk through the door they are getting nothing but the best.